William Clifton McWilliams, of Rolla, MO passed away Sunday, January 13, 2019 at the age of 59 in Columbia, MO. Bill was born in Indianapolis, Indiana on August 16, 1959 to Robert M. McWilliams and Dorothy J. (Small) McWilliams Glenn. He was preceded in death by father, Robert McWilliams, mother, Dorothy Glenn, stepfather, Max Glenn, and a sister, Carol Leonard. Bill was medically retired from the United States Army and loved being a firefighter for DCFD “829”. In his younger years, he loved to be outdoors, playing softball as well as umpiring, paintballing, bowling, hunting, golfing, fishing and camping with his three sons. 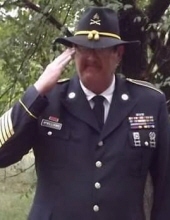 He loved his job of 19 years in the military funeral honors. Bill will be greatly missed by his surviving family which includes: his wife, Roberta “Rosie” (Ruth) McWilliams of the home; his sons, Robert McWilliams (Jennifer), James L. Menzies II and John E. Menzies, all of Rolla; grandchildren, Tyler Menzies of Midway, GA with his mom, Angela, Brittany Parsons (Zack) and Nicole Cotner (Jessie); great grandson, Aiden Cotner; one brother, Dale McWilliams (Judy) of Rolla; sister, Sharon Wallace (Robb) of Clinton, IN; special family, Heath and Amanda Terrill and girls and Kyle and Amy Lundsford; as well as many other family and friends. Bill had a heart of gold. A funeral service for Bill C. McWilliams will be conducted at 11 a.m. on Friday, January 18, 2019 at the Null and Son Funeral Home of Rolla. Interment with full military honors will follow at the Missouri Veteran’s Cemetery in Waynesville. A visitation for family and friends will be held from 6-8 p.m. on Thursday, January 17 at the funeral home. Memorial contributions are suggested to the family to assist with funeral expenses. To send flowers or a remembrance gift to the family of William Clifton McWilliams, please visit our Tribute Store. "Email Address" would like to share the life celebration of William Clifton McWilliams. Click on the "link" to go to share a favorite memory or leave a condolence message for the family.